Today at lunch, one committee room in the Capitol was packed tight as legislators, lobbyists, and staff crowded in. Politicos of all stripes can’t help themselves. They all just have to hear the latest polling numbers and the Rasmuson Foundation had them. In a “lunch and learn” session sponsored by the House Finance Committee attendees heard Rasmuson Board Member Jeff Cook and President and CEO DIanne Kaplan walk legislators through polling they had conducted with the help of polling firm Strategies 360 between January 3-10 on state budget issues. 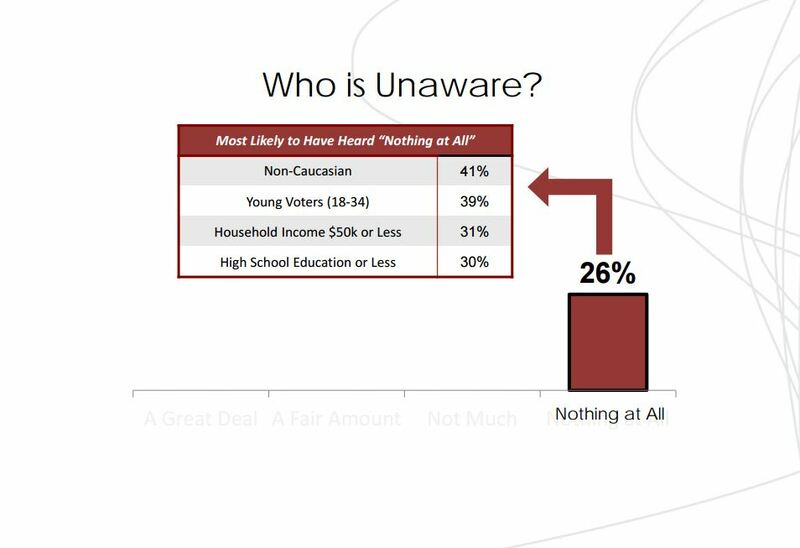 If you’re so inclined you can view the slideshow, video of the presentation and Q&A with legislators, or the full polling results for yourself. Alaskans know the state has a budget problem. Almost 70% responded they have heard at least “a fair amount” about it. That is pretty good for a public policy issue. 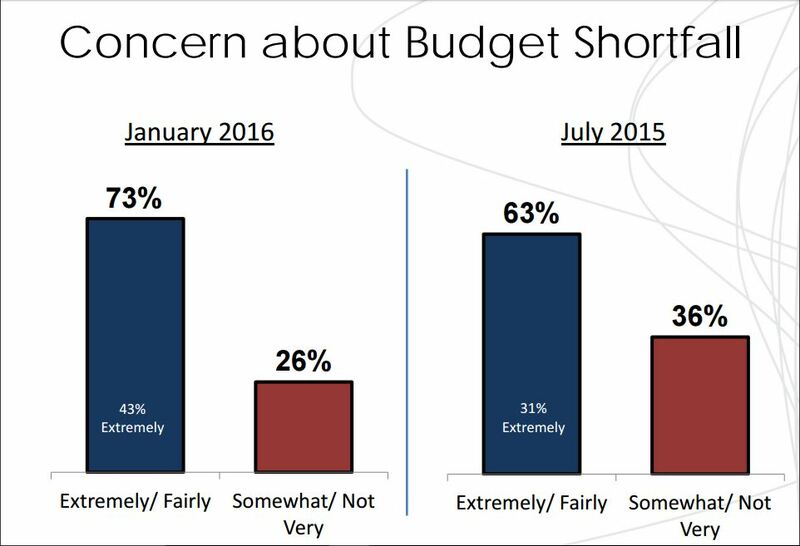 Alaskans are concerned about the state’s budget problems. 73% say they are extremely/fairly concerned. That is up 10 points since similar polling last July. Two points on this slide 1. Oil tax increases are pretty popular, which has to make folks at AOGA, RDC, and The Alliance pretty nervous. 2. 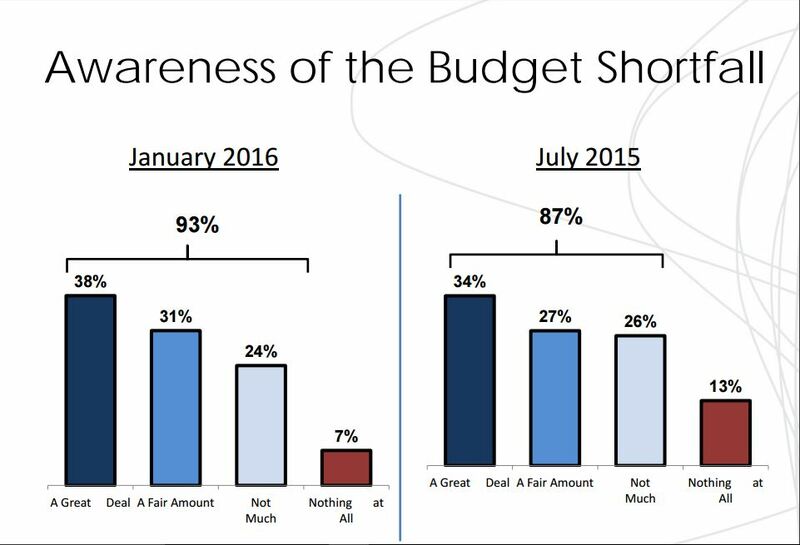 People are more willing to like fiscal decisions they think won’t hit them personally. An odd slide set. 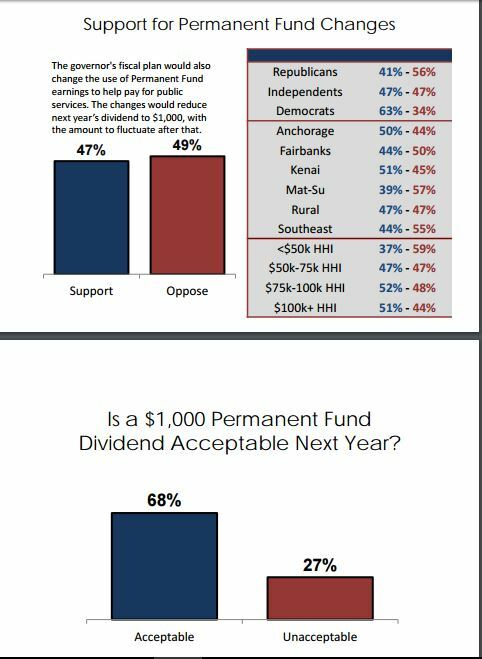 The first says 49% of Alaskans would oppose changes that would reduce their Permanent Fund Dividend (PFD) to $1,000. 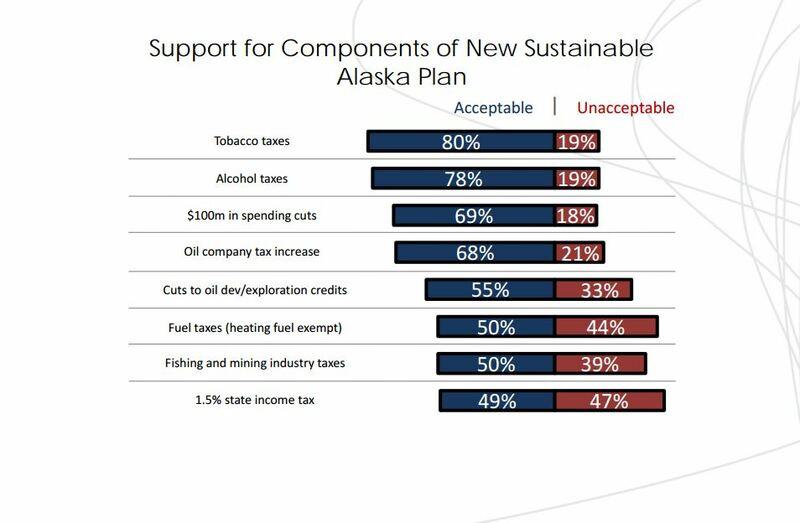 The second slide says 68% would find such a move “acceptable.” The message here may be Alaskans don’t want to cut into their PFD, but if it happens they’ll live with it. 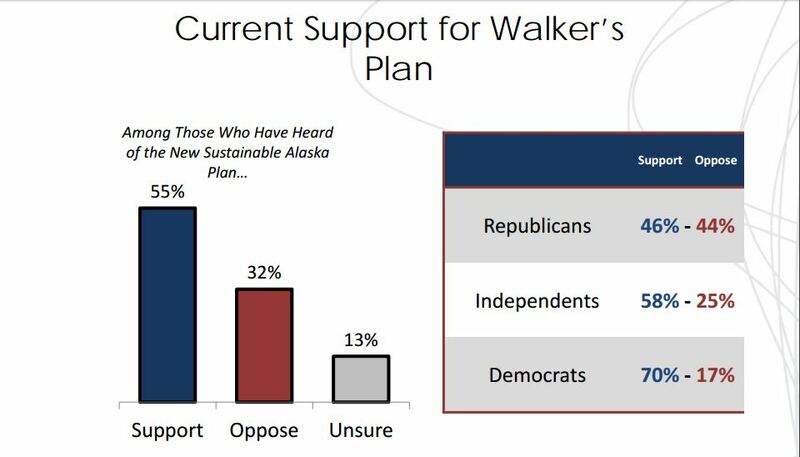 The interesting thing here isn’t that 55% of Alaskans support the Governor’s fiscal plan, it’s that even among Republicans, more support it than oppose it. The Governor has to be loving this slide. It would seem not only has the message gotten across that the state has a budget problem, but maybe more importantly the problem is so big no one action can solve it. 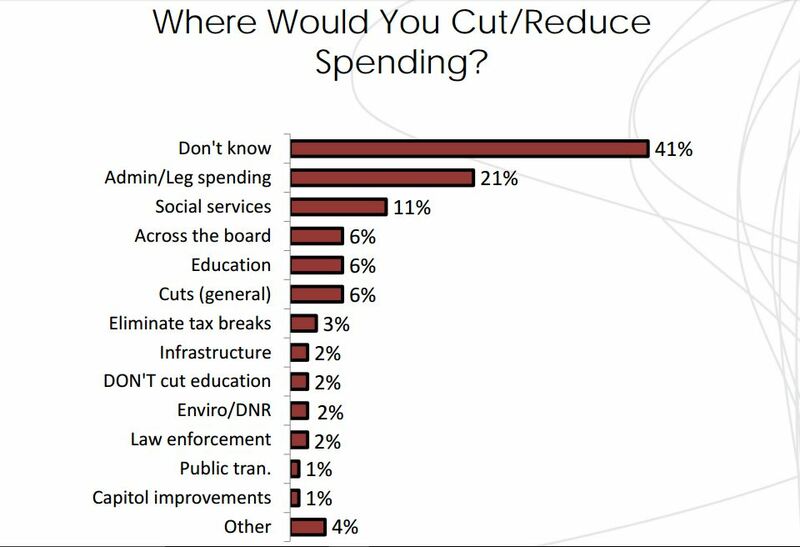 A vast majority of Alaskans believe both more cuts and new revenues are necessary. Draw your own conclusion about this slide. 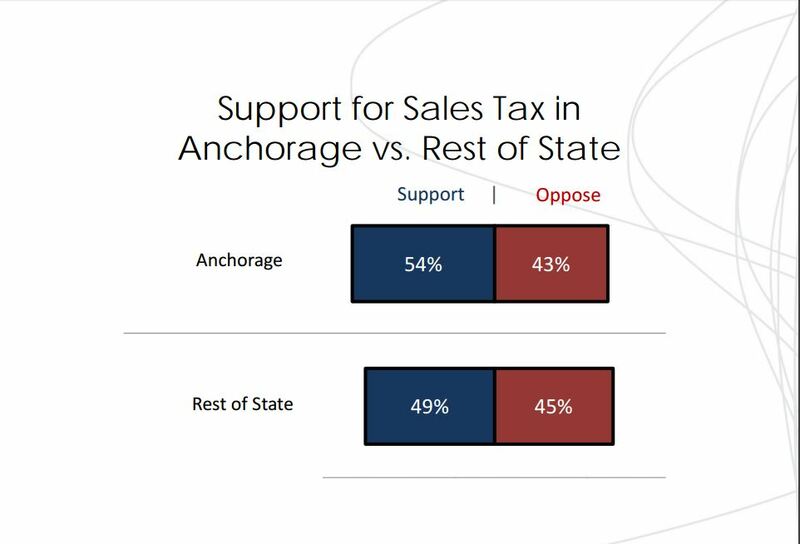 A sales tax is more popular in Anchorage than the rest of the state. Then again Anchorage is one of the few places in the state currently without a local sales tax. 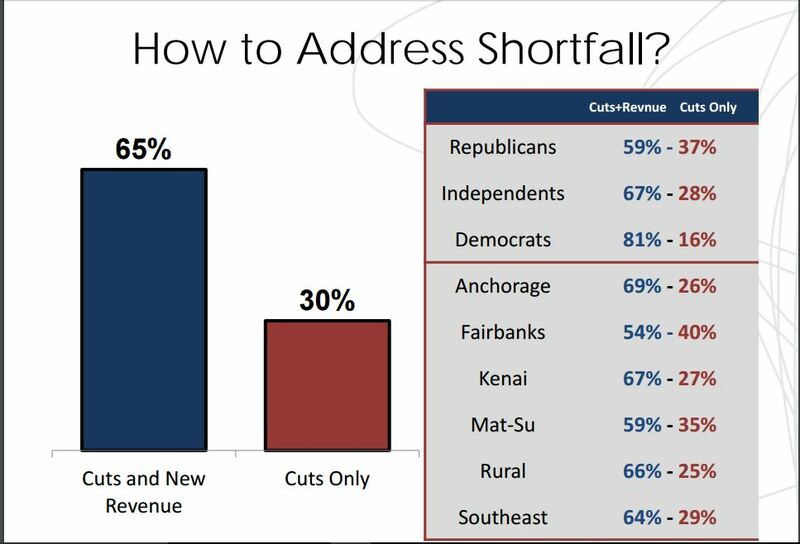 The way I read this slide is at least 76% of Alaskans have no earthly idea where or how to cut the budget. They just want it to magically happen and not affect them. See that 32% in the “much less” column, it is higher than the “much more” and “somewhat more” numbers combined. That means this is where the passion is, and a passionate voter not only votes they tend to move others in their direction. 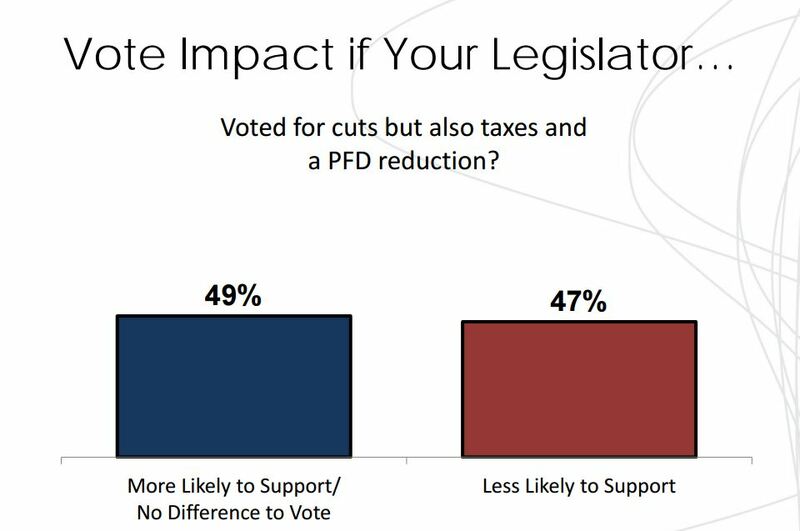 What this may really show is a pocket of seething anger towards PFD cuts, spending cuts, and/or new taxes out there some unsuspecting incumbent may walk headlong into come election time. 4 Comments on "10 Takeaways from Rasmuson’s State Budget Polling"
Thank you Casey. I appreciate your observation regarding a “seething anger” among the electorate. I sense we are at a tipping point and perhaps all it will take is that next junket (like the Seattle fiasco) or next LIO deal for these legislators to lose what little credibility they have with Alaskans. Politics is based on image more than performance. The biggest fear these legislators should have is that they create the image that they are no longer a legitimate institution. Regarding #4….the $100 million cut is beyond laughable. It’s 2% of a budget that is about 350% larger than revenues. Was that put in there as a joke? I see the Rasmuson poll as somewhat encouraging. People are beginning to see that there is a problem, and it will take a combination of cuts and new revenue. The “old news” here is a vast majority want “new revenue”, but they don’t want it to come from them – Alcohol, Tobacco, Oil/Gas, Mining, etc. – it’s going to take big cuts in government, taxes (likely income and sales), and getting rid of the dividend and using it to pay for OUR government. Incenting the oil companies to drill more makes a lot more sense than trying to drive them out of the state with more/new taxes. Anyone been to the Chevron/UNOCAL offices lately?